CASE: ORIGINAL DS CASE / GREAT CONDITION. ART COVER: NON ORIGINAL CUSTOM REPRINT COLOR COPY / GREAT CONDITION. MANUAL:NOT INCLUDED. BUY ONE FROM Japan and it will take 2 to 3 weeks. 100% AUTHENTIC 100% JAPANESE WILL NOT PLAY IN ENGLISH. (WILL NOT PLAY ON USA 3DS SYSTEM). THIS IS FOR THE CARDBOARD BOX AND PAPER WORK SHOWN ONLY. Pokemon: HeartGold Version (Nintendo DS, 2010) 100% AUTHENTIC! READ DESCRIPTION! 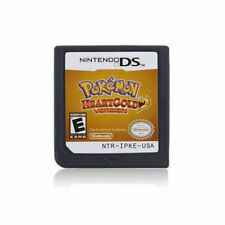 You are bidding on Pokemon: HeartGold Version for Nintendo DS. This listing is for the cartridge only, no case. The game is in good condition and works great; I attached a picture of the game working to prove this. The game is also 100% authentic, not a cheap replica. As always, I ship within 24 hours of payment (due 48 hours following auction end) via USPS First Class with tracking information available. Please check out my 100% positive feedback and experience selling video games and bid with confidence! Pokemon: HeartGold Version comes just with instruction manual (Nintendo DS, 2010). Condition is Very Good. Shipped with USPS First Class Package. works perfectly saves games . the Game was tested and it works an saves This is a reproduction Pokemon: HeartGold Version (Nintendo DS, 2010) GAME CARTRIDGE ONLY. Pokemon: HeartGold Version (Nintendo DS, 2010). Condition is Very Good. Shipped with USPS Priority Mail Small Flat Rate Box. Pokemon: HeartGold Version (Nintendo DS, 2010). Condition is Very Good. Shipped with USPS First Class Package. Photos of game you will receive. Comes with case and manual. Any questions just ask! Pokemon HeartGold Nintendo DS Game + Pokewalker Complete! Pokemon HeartGold DS game 100% complete. Includes outer box, game case, game cartridge, Pokewalker accessory and clip, all original manuals and inserts and an extra battery. Tested and working. Everything is in very good condition, except the outer box which has a few small creases. Please message me with any questions and thanks for looking. Original Pokemon: HeartGold Version (Nintendo DS, 2010). Condition is Very Good. Includes the Game Cartridge Only. Ships USPS ASAP after receiving payment. Ships in 48 contiguous states only. If you have any questions about the item please contact seller. Pokemon: HeartGold Version (Nintendo DS, 2010) 100% AUTHENTIC CART ONLY. Condition is Good. Shipped with USPS First Class Package. New ListingPokemon: HeartGold Version (Nintendo DS, 2010) Game Only. Pokemon: HeartGold Version (Nintendo DS, 2010) Game Only.. Condition is Good. Shipped with USPS First Class Package. Pokemon: HeartGold Version. Platform: Nintendo DS. PlatformNintendo DS. Region CodeNTSC-U/C (US/Canada). soon as possible. Release Year2010. can take longer. EANDoes not apply. You will start with 0 badges obtained, so you can start your own adventure. The PC Storage (Boxes 1-18) will be preloaded with all 493 Shiny Pokémon. All 493 Shiny Pokémon Preloaded into the PC Storage! Nintendo Power #252 Featuring Pokemon Heart Gold and Soul Silver and More Excellent Condition. What you see is what you get! Ho-Oh is inside Pokewalker! 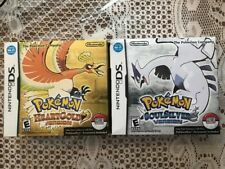 - For sale here is Pokemon HeartGold Version TESTED 04/16/2019! 100% Authentic! IMAGE IS EXACTLY WHAT YOUR GETTING! You will start with 0 badges obtained, so you can start your own adventure. The PC Storage (Boxes 1-18) will be preloaded with all 493 Shiny Pokémon. All the Pokémon have the best possible stats and move sets and are perfect for any collector or competitive battler! 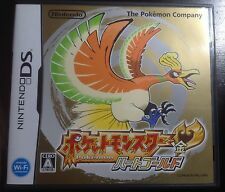 For sale here is Pokemon SoulSilver Version Pokemon HeartGold IMAGE IS EXACTLY WHAT YOUR GETTING! TESTED 04/02/2019! All pokemon will have theirnatural abilities andrandomized natures. Also many of you haverequested LvL 5/Non Shiny Pokemon so I haveincluded, in thespare PC spaces, ahandful oflegendary LvL 5/Non Shiny Pokemon. For sale here is Pokemon SoulSilver Version Pokemon HeartGold IMAGE IS EXACTLY WHAT YOUR GETTING! 100% Authentic! Everything is in great condition. This is the Japanese Version of Pokemon Heart Gold. This included the Pokewalker, but it needs a new battery. The language is Japanese. There is no manual. The 72 Pin Connector inside of your original Nintendo console is the key to the longevity of your system. I can provide you that trust! IMPORTANT INFORMATION ABOUT YOUR NINTENDO SYSTEM! Pokemon: HeartGold Version (Nintendo DS, 2010) Game Only.